Located in the greater Seattle area of the State of Washington, the Town of Yarrow Point is bordered on three sides by the eastern shoreline of Lake Washington. This peninsula covers approximately 231 acres, has 4.32 miles of streets, and includes about 405 homes housing an estimated population of 1,010 residents. The town's proximity to the business centers of both Seattle and the Eastside makes it a desirable location. In addition, the sylvan look and feel of this residential community offers residents respite from the many pressures of our modern world. First homesteaded in the late 1880's, the Town was incorporated in June 1959 to preserve its unique characteristics in the face of significant changes throughout the greater Puget Sound region. While one fourth of the homes in Yarrow Point enjoy waterfront locations or water access, the remaining three quarters offer views ranging from expansive to territorial. 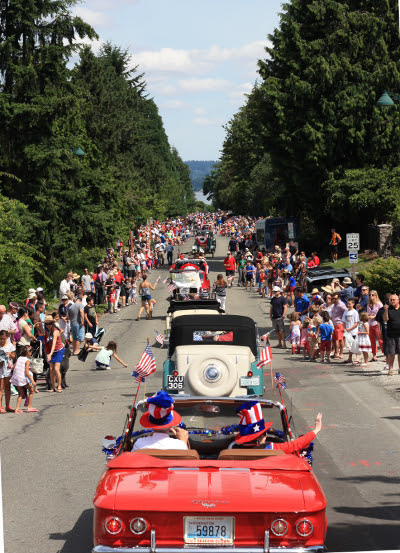 Known for it's friendly, almost beach town vibe residents throw a lauded 4th of July parade and party every year. Don't miss the strawberry shortcake!